Up until what level would you play this? The decline of smoking at chess tournaments pretty much followed the decline of smoking in (western) society. It was around for a couple of years when I first started playing, but most chess clubs and tournaments became smoke free around the mid 1980's. I can remember some controversy at a Doeberl Cup in the 1980's when the organisers were asked to contribute to the anti-smoking movement by putting up the "smoking harms you health" type signs at the tournament. The only problem was that smoking hadn't actually been banned at the tournament at the time, and Max Fuller requested the signs be removed as he found them either offensive/annoying or stupid (I cannot quite remember which). 6. Non-Smoker: Little is known of this type as he is practically non-existent, and therefore his inclusion is purely nominal. Earlier in the year I reported on the growing controversy about early version of Rybka being a clone of the Open Source chess program Fruit. At the time the International Computer Games Association were planning to investigate the claims. The investigation is now finished and the verdict is now in. Basically they have found that Vasik Rajlich (the author of Rybka) based his early versions of Rybka on Fruit and Crafty (both open source) and failed to declare that Rybka was based upon these programs when entering ICGA events. As a result Rybka has been stripped of the World Computer Championship titles it won in 2007,08,09 and 10. Vasik Rajlich has also been banned from entering any ICGA events for life. There is also the issue of whether Rybka breaches the Gnu Public Licence that was attached to Fruit. This case may be taken up by the Free Software Foundation, and may either see Rybka entirely withdrawn from the market, or that Rybka be subject to the GPL (ie source code being made public). Chessvibes has extensive coverage of the ICGA findings, including links to the relevant documents concerning the case. While I draw my material for my Open & Shut column from a number of sources, I normally use the Chess Today archives to select my miniature of the month. As their monthly database is released in the following month, there can be quite a gap between when a game is played, and when it appears here (especially if I dawdle over my choice of game). So here is a game from May 2011. I don't know anything about the players involved, except that White seems to have a keen eye for an attack. While a number of Australian players headed across the Indian Ocean to play in the Commonwealth Championships, a couple decided crossing the Pacific was the way to go. Young Australian FM's Junta Ikeda and Moulthun Ly have travelled to Philadelphia to take part in the 2011 World Open. The event has a guaranteed prize pool of $225,000 (US), and over 1000 players are expected to take part. Before the main event starts, both Ikeda and Ly are warming up by playing in the Philadelphia International. This is a 9 round, 5 day event, with a $10,000 prize pool. At this stage Ly is on 3.5/5 while Ikeda is on 2/5. If you can navigate the World Open website (it can be a little tricky) you can follow the progress of the Australian players. Actor Peter Falk passed away on the 23rd of June. He was one of my favourite actors, appearing in The Princess Bride, the Columbo TV series, and playing himself, as an angel, in Wings of Desire (amongst many other films and TV shows). His connection with the world of chess was two-fold. In real life he was a chess aficionado, who spectated a couple of big chess events in the US (the 1983 US Open being one). In the character of Columbo, he matched wits with Grandmaster Emmett Clayton, who had attempted to murder a rival. Of course in this episode, "The Most Dangerous Match", Columbo outwits his opponent, and gets his man. The 2011 Commonwealth Championship gets under way in South Africa tomorrow. At this stage the tournament is looking massive, with about 450 players in the championship event, and another 350 players in the supporting event.Most of the players are from South Africa, or neighbouring countries like Botswana and Namibia, but both India and Australia have reasonably sized contingents. The Australia charge is head by GM David Smerdon, who is making his way to Amsterdam, via South America and Africia. (btw You can read all about his travels on his blog). Top seeds are Nigel Short, Abhijeet Gupte and Gawain Jones. Smderdon is 6th seed, while Tristan Stevens is seeded 48th. As in the previous Commonwealth Championship, players from non-Commonwealth countries are allowed to take part, but are ineligible for the title. News from the Russian Championship (Ht Milan Ninchich), shows that what the public demands, the organisers enforce. This tournament, which is a qualifier for the real Russian Championship aka Russian Super Final, has a couple of extra playing conditions. The first is the extension of the "No draws in under 30 moves rule" to "No draws in under 40 moves" rule. I'm guessing this is not too onerous, although it does require a few more "non-book" moves from players determined to split the point. The second is substantially more drastic, especially in its enforcement. Players are forbidden from leaving the playing area, although this rule hasn't been enforced in the past. However GM Dmitry Chuprov found that it was being enforced this year, and had a win turned into a loss due to his breaking the rule twice in a game. Chessbase has a report on the tournament, including the enforcement of these new rules. A couple of weeks ago I bought a pile of second hand books off Milan Ninchich. Now Milan and I have played plenty of exciting games over the years, as both of us like to throw almost everything into the attack. One of the books I purchased was a 1974 edition of "Encyclopaedia of Chess Opening, Volume C". Tonight I was casually flicking through it, and reached my favourite section C57. When I opened the page I noticed a small slip of paper, apparently being used as a bookmark. 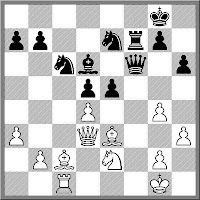 Why this is significant, is that Milan and I once played a cracker of a game in the Traxler variation of the Two Knights Defence, which of course has the ECO code of C57. Now I don't know whether the book mark was placed there before this game (played in 1994), as a consequence of the game, or it was there for an entirely different reason. But it does give me an excuse to once again show probably the best Traxler I've ever played. The Kings tournament in Medias, Romania, has ended in a tie for first between Magnus Carlsen and Sergey Karjakin, after they split the point in their final round game. Carlsen edged Karjakin on tie-break with a slightly better S-B score. Of the other players, Vassily Ivanchuk continued to entertain. After a good start to the tournament his second half was almost a complete disaster. He lost a truly awful game against Karjakin in round 9, and even his most ardent fans were writing this one off as "one of those tournaments" for Ivanchuk. However he bounced back in the final round to grind out a win against Nakamura. At some point I will have to get myself a portable eBook reader, but for now I just whatever runs on my Netbook or PC. The Opera browser, which I sometimes use, has an eBook widget that allows you to read books in the ePub format, as well as manage your library. At this stage I've only downloaded a few books, and surprisingly, not all of them were about chess! However one chess book I did find was "The Exploits and Triumphs, in Europe, of Paul Morphy, the Chess Champion" by Frederick Milnes Edge. It is not a chess book in the classical sense, in that it doesn't contains games or diagrams (though this may the fault of the conversion process), but instead covers Morphy's travel through Europe in 1858. It also reports upon the First American Chess Congress, and has a chapter devoted to the leading London chess clubs of the time. I find these historical pieces quite interesting, as it describes a chess that is far more leisurely than we see today (even at the amateur level). The description of London club life often fills me with envy, and often wonder if such a club would be viable today. I downloaded a copy of this book from www.manybooks.net and found it (and a couple of others) by simply searching for 'chess'. Helen Milligan posted a slightly strange link on her facebook page, concerning the 2012 Chess Olympiad. Travelshop Turkey is already advertising the event, with a lengthy blurb on the tournament. The blurb is 'mostly' accurate, although someone has snuck in at least one entertaining paragraph concerning a fictitious champion by the name of Anthony Duskey. While it has lots of information concerning the host city and country, the one thing it is missing is the dates of the Olympiad. At this stage it looks as though it will be in Autumn (September - November) but I haven't seen dates any more specific than that. But this isn't a real surprise, as most details don't firm up until about 6 months before the event (if not closer!). Carlsen has once again taken the lead in the Kings tournament in Romania, with a Rd 7 win over Vassily Ivanchuk. In second place is Karjakin, who drew his game with Radjabov. Radjabov once again wheeled out the Schliemann defence against the Ruy Lopez, which he has done on and off over the last few years. This time Karjakin decided to challenge it head on, rather than with 4.d3, which has been to most common reply at the top level in recent years. Karjakin even had an extra pawn by move 10, but two bishops and open lines was enough compensation for Black. With 3 rounds to play Carlsen is the favourite to win, but in a pairing that may please the organisers, he is due to play Karjakin in the final round. If you see this now and it disappears later you're not going mad. I'm just testing some stuff for the blog. OK, this seems to work, which is odd, as when I tried it last year it failed to work as advertised! In his "Canberra Times" chess column, Ian Rogers reported on attempts at bring the BBC chess series "The Master Game" back to our screens. It was not, of course, the television screen, but the far more modern medium of the computer screen. On Youtube, the user Sirb0b1 has set up a channel with episodes from the 1980 to 1982 series. Ian also revealed that the 1983 series seems to have been lost, and at this stage no episodes from this series have been posted. 1.e4 e5 2.Nf3 Nc6 3.Bc4 Bc5 4.Bxf7?! is the Jerome Gambit, which was played during the 19th century. It is completely unsound, and I found only won win for White in my database (which I will give below). However it is only unsound against strong opposition and may be effective against weaker opponents. Is this an acceptable approach to playing chess, or is the game about 'absolute' truth? At a junior club I coach at there is a player who either plays this or even an accelerated version of it (1.e4, 2.Bc4, 3.Bxf7+) I have told him it is unsound, and will not work against strong opponents, and he accepts this. However he argues that it works against almost all of his opponents, which is true. It also helps him learn some attacking ideas, that may be useful as he improves. So at this stage I'm not to doctrinaire with him on what is 'proper' and what is not. I'm also assuming that a couple of bad losses in serious competition will eventually show him the folly of his ways. The following game was the only win I found for White in this line. It was played by Henry Charlick (from Adelaide) and is one of a number of games where he showed some inventive opening ideas. I have no idea where the notes for the game have come from, but am assuming they may be the original notes from when the game was first published in the local press. The Kings tournament has come a long way from the snooze fest that was its inaugural edition. With Carlsen, Karjakin, Nakamaura, Ivanchuk, Nisipeanu and Radjabov making up the field, there is no shortage of fighting chess. While there have been a number of drawn games, most of theses have shown a lot of fight before peace has been declared. At the moment 4 rounds have been played in this double round robin event. Carlsen is 2.5, Radjabov is on 1.5, while everyone else is on 2. Round 5 is being played this evening (Canberra time), with a rest day to follow. Then the second half of the event runs for the following 5 days. To follow the tournament online, visit the official website here. Is all publicity good publicity? I've always thought 'no', although I am sure there are those who might see it differently. FIDE President Kirsan Ilyumzhinov may be one of those people. Despite the ongoing NATO bombing of Libya, and the ground battle between pro and anti government forces in that county, Ilyumzhinov thought it would be a good idea to visit Tripoli and drop in on Mummar Gadaffi. There they played a game of chess, which was captured on film, and is currently being shown around the world. Of course this is not a good look for FIDE, and already the blogs and discussion boards are running hot with condemnation of Ilyumzhinov's actions. However FIDE management don't seem to be worried by this, as they have featured the visit prominently on their own website. (Although they didn't go as far as the Washington Post, who promoted Ilyumzhinov to 'Chess World Champion'). Apart from the damage this will inflict on the reputation of FIDE itself, there is another, more personal, issue. 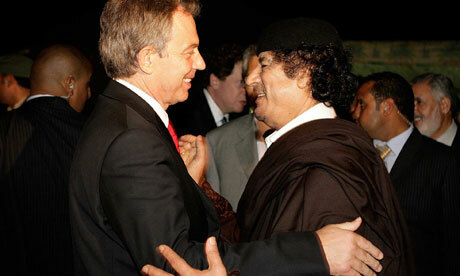 Can FIDE afford to have a President who will now be compared the person on the left of this picture? After a dramatic final round, the 2011 NSW Open ended in a tie between FM Junta Ikeda and FM Max Illingworth. Ikeda defeated Pengyu Cheng in the board 2 clash, while Illingworth had the much tougher task of playing GM Zong Yuan Zhao. In a see sawing game, the advantage swung back and forth with both players missing clear winning chances. With spectators crowding around the board, Illingworth looked like he was lost, until a final trick enbled him to salvage a draw, and a share of first place. Illingworth and Ikeda took home $1250 each, after finishing on 6/7. The draw relegated Zhao to third place, along with IM Gary Lane, IM George Xie, and Armen Avyazyan. In the Under 1600 event a last round win by Muhamed Buza over Anthony Villanueva left them sharing first place with 6/7. Shannon Vuglar was outright third on 5.5/7, ahead of a 9 way tie for 4th. Full standings from the Open are available here. After 5 rounds of the 2011 NSW Open, FM Max Illingworth is on 5/5. After beating Anton Smirnov and Blair Mandla in Rds 3&4, he defeated IM Gary Lane in tonights rounds. He is now half a point ahead of FM Junta Ikeda, who he will play in Round 6. Ikeda drew with GM Zong Yuan Zhao in Round 4, before defeating John Papantoniou is round 5. Zhao is on 4 points (draw with IM Xie in Round 5) along with Blair Mandla, Kinto Wan, Reynante Calixto and Pengyu Chen. In the Under 1600 Anthony Villanueva is on 5/5, closely followed by Nick Beare on 4.5/5. Once again the NSW Open attracted a bumper field, with 145 players entering (although a couple did not turn up). The Open section had 78 players while the Under 1600 had a field of 67. The spacious venue at the Parramatta RSL Club had no difficulty in accommodating the large field, and after a slightly delayed start, the tournament got underway. Today saw the first two rounds, and while there were a couple of upsets (Kevin Tan beating IM Andrew Brown a notable one) the field has yet to sort itself out. With 3 rounds tomorrow (at 90m+30s per game) the player with the greatest stamina may be the ones leading the event. One player who seems to have the right tournament strategy in this regard is IM Gary Lane, who only spent 29 moves to reach 2/2. In both cases his opponents went wrong in the opening, and he wrapped the games up pretty quickly. Live coverage of the top 3 boards can be found here, while results and draws (for the Open) are here. The 2011 NSW Open is shaping up to be just as popular as lasts years big event. So far there has been about 120 pre entries, with 67 players in the Open event. Top seeds are GM Zong Yuan Zhao and IM George Xi. IM Gary Lane and newly minted IM Andrew Brown are also in the field, along with a couple of young challengers in the shape of FM Max Illingworth, FM Junta Ikeda and Fedja Zulfic. There will be live coverage of the top games via the Parramatta Chess Club website, as well as updated results throughout the event. For those wishing to enter it isn't oo late, as long as you make it to the Parramatta RSL Club by 12:30 pm tomorrow. While looking at the whole 'Cloud Computing' idea (specifically the Jiolicloud Linux distro), I came across the Scribd. Scribd can probably be described as an online publishing forum, where you can uplaod documents for others to read (as well as reading what other have published). There seems to be plenty of "Chess" documents there, but I haven't had time to check them for quality. Interestingly it isn't just books that you can access, as I have seen designs for origami chess sets, and chess score sheets also on the site. However my main interest (for the moment) isn't as a reader, but as a publisher. I've begun to upload old chess articles I have written over the years, starting with "Open and Shut", the column I write for Australasian Chess (Brian Jones, the publisher, is cool with it). As I've written about 50 columns so far, I figured that there is no harm in releasing the older ones to the public. I've even chosen a fairly generous copyright license, in that anyone is free to republish the articles, as long as attribution is given. As I am new to the site, I'm not sure what is best way to find the document I puet up. Here is a link to the first Open and Shut column, but to find the other I suspect you need to search for 'openshut' or my name. FIDE have announced the lowering of the Rating floor (the lowest publishable rating) down to 1000. They are also moving to monthly lists from July 2012. I'm assuming that this will be the final change to the rating floor, although I had previously believed that 1200 was going to be the final floor. I would be suprised if it goes any lower than this. The move to monthly lists has been applauded in most circles, as it makes the ratings more 'live' than previously. However while this may be important for rating 'watchers' (either players or journalists), I'm not sure this is that significant. What it may effect is the reporting process for tournaments, in that there will be less deadline 'angst' amongst tournament organisers, as if you miss this month, then next month isn't that long to wait. Congratulations to Dr Daniel Bayliss for the discovery of planet WASP-17b, a planet that travels in the opposite direction to the spin of the star it orbits. This is the first planet discovered that exhibits this behaviour, and bucks the established theory that planets are formed from the same rotating material that form stars, and therefore should rotate in the same direction. Apart from being an astronomer Daniel was a foundation member of the Australian National University Chess Club, although his academic career has taken precedence in recent years. The full story on this discovery is here. At the top level, playing more than one round a day is an outrage, while further down the ladder, playing only one round a day is not enough chess! The distance between both positions is most evident in Australia over the Queens Birthday Weekend. Taking advantage of the long weekend, a number of tournaments are being held around the country. Queensland is holding the State Championship (with a particularly strong field this year), while other states are holding big weekenders. Both NSW and Victoria are holding their state Open's, and both events normally attract large fields (almost 150 at the NSW Open last year). However the schedule can be brutal, with 2-3-2 as the number of rounds on each day. Sunday sees 3 rounds played with a 90m+30s time control, so it is hardly surprising that a games are still going after midnight, even with the 10 am start to the day! Not conducive to perfect chess, but no denying that players are getting value for money. In a breaking story from the 2011 German Championship as player has been expelled from the tournament for using his smartphone to assist him during his final round game. FM Christoph Natsidis was questioned following the completion of his final round game against GM Sebastien Siebrecht, and was found to have a smartphone on his person, with a position from his game still in the chess engine. He then confessed to using the program during the game and was expelled from the event. While it is too early to know what final punishment awaits Natsidis, he has already lost the IM norm he scored in the event. In fact he had already wrapped it up by round 8, and the result of his final game in fact did not matter (except for final placing/rating points/ prize money). There is a full report on Chessvibes including quotes from Siebrecht. In one quote Siebrecht claims the arbiter 'did nothing', during the game, but then says that after the game the arbiter then questioned the player, with Siebrecht present. Given the outcome I would tend to think the arbiter instead did the right thing, as the burden of proof in such situations should be necessarily high (unless of course players are willing to be searched by arbiters at any stage during the game!). The final sting in the tale is that Natsidis is a law student, so I suspect his behaviour may end up having ramifications beyond the world of chess. World Champion Viswanathan Anand leads his exhibition match with Alexei Shirov 1.5-0.5 after the first days actions in Leon, Spain. The first game was drawn, while the second game saw Anand lay into Shirov's positions after the latter dropped 2 pawns in the opening. Despite Anand having a clear advantage it was still an attractive win, with the final position especially nice. In what may be a timely antidote to the recent candidates matches, a exhibition match between World Champion Viswanathan Anand and former challenger Alexei Shirov is starting tonight in Leon, Spain. The match is over 6 games and will be played with the fast time limit of G45m+30s per move. The schedule calls for 2 games a day, with a blitz playoff if the match is tied 3-3. The first game begins at 12:30am Canberra time, and live coverage is at the event website. Ever since I was a teenager I always wondered how chess and video games could be combined in a workable way. My own ideas didn't amount to much, as I tended to think along the 'problem solving' style of game, rather than the shoot-em up format which is obviously more popular. Assuming I wasn't the only one thinking about this topic, it has taken quite a while for someone to come up with a solution. Now it looks like someone has. A new game for the iPhone/iPad/iPod platform combines the action of an arcade shooter, with the strategy of chess pieces. In Knight Defense, you use your pieces to stop enemy pieces descending down the board. Your pieces attack the enemy pieces in the same way as they move (ie bishops shoot diagonally, rooks up and across), all in real time. They also have the opportunity to 'power-up', just like in classic arcade games. Even one sided games can produce a bit of fun, especially during the post mortem. In the given position White is clearly winning, and Black (to move) blundered with 23. ... Kf8. White pounced with 24.Qh8+ Ke7 25.Qe8# In the instant post mortem White suggested 23. 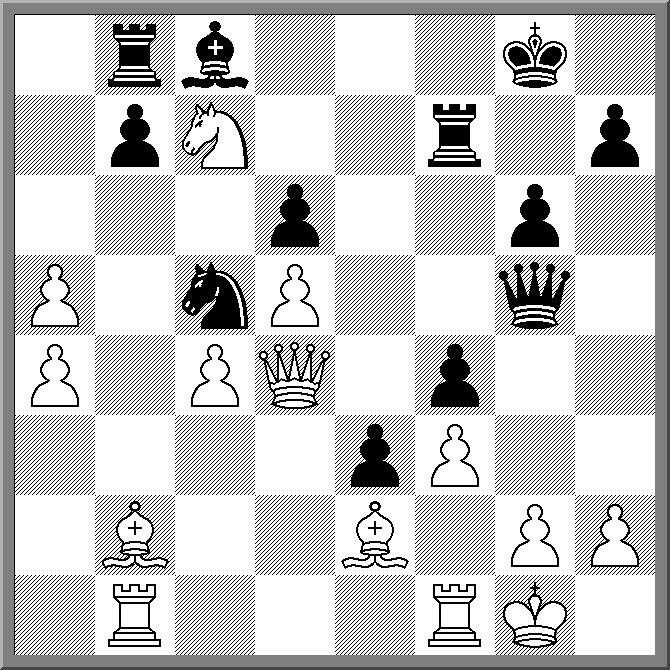 ... Rxc7 as he could only see 24.Qh8+ Kf7 25.Qxh7+ Ke8 26.Qxc7 when Black fires back with 26. ... Bh3! This offers a second rook, but the mate threat requires White to begin returning material straight away eg 27.Qxb8+ Kd7 28.Rf2 exf2+ 29.Kxf2 Qxg2 30.Ke1Qg1+ 31.Kd2 Now Black can take a draw with 31. ... Qe3+ or try for a little more with 31. ... Qxb1 Having reached this position the collaborative effort of players and spectators then found a number of mates for Black, although none of them were exactly forced. Sadly, White doesn't have to give Black so many chances to get back into the game as 24.Qh8+ Kf7 25.Bd4 (or even 25.h4) ruins the party. If Black tries 25. ... Bh3 then 26.Qxh7+ doesn't win the rook on c7, but simply cleans up the bishop on h3.